Although summer doesn’t officially end until later this month, many people consider Labor Day the last day of summer. After all, by this point, most students are back in school. I graduated from Cal State LA last year, so this is my second year not going back to school and it still feels so weird! I actually liked school and miss it a lot. If it wasn’t for the fact that school is expensive, I would’ve kept going to school to get my masters. Oh well. I have my bachelor’s degree and I’m happy with that. That being said, this summer was really good for me. One thing I look forward to every four years during summer is the World Cup. This summer was no different. Although the United States or Italy did not take part in the World Cup, there were still many good matches. France ended up winning the final against Croatia, but along the way, there were many upsets and surprises. One of the most shocking things that happened was Germany did not even make it out of the group stage and they had won the previous World Cup final. I guess the curse of World Cup winning teams is true. Also, Spain, who were one of the favorites to make it to the final, lost against Russia, one of the teams that no one expected much from. Argentina and Portugal disappointed and so did Brazil. Overall, it was a good World Cup. Can’t wait for 2022, I hope Italy and the United States make it next time. Every year since 2011, I have gone to see a team from Europe play a friendly match in Los Angeles. Usually it’s Real Madrid, but this year they didn’t come to Los Angeles, unfortunately. However, this year AC Milan came to Los Angeles. They are my boyfriend’s favorite team. I like watching them, although they aren’t my favorite Italian team. It was a good game even though they ended up losing to Manchester United. My mini vacation to Las Vegas trip was a lot of fun. It was only few days, but still enjoyable. Next time I go, I will make sure not to go during the summer though because it was super hot. I think I will go back in November 2019 and this time, I will drink more since it is Las Vegas. The best part of the trip was the Backstreet Boys concert. I really hope I can see them again next year. The city where I used to work had free concerts at the park every Friday in the summer. My family decided to go to the last concert of the summer. My mom loves listening to Brenton Woods. I grew up listening to his music. As luck would have it, Brenton Woods was the main even of the last concert. It was free so the whole family got to go. There was so many people there. It was still fun though. Three of my coworkers went and I met up with them. I admit that sometimes I watch way too much TV, Netflix, Hulu etc. So I decided to see if I could stay away for a while. I decided to take part in the 30 day no TV challenge for the month of August. Overall, I was successful. I watched TV only once in the entire month. I missed watching TV at first, but eventually I found better things to do. Two things I missed out on were my weekend getaway trips to San Francisco and San Diego. I had planned to go to San Diego at the beginning of June for the Rock and Roll 5k and Half marathon races. However, I had to cancel due to financial reasons. The following month, I had planned to go to San Francisco for the San Francisco Half Marathon. I cancelled that trip because it didn’t seem like it would be safe for me to be in the city alone, even if it was just for the weekend. I plan to run that race next year, fingers crossed. I ended my summer by going to Knott’s Berry Farm with my family. Even though I couldn’t get on any of the rides, I still had fun. We didn’t know about it until we got there, but the day we went was one of the days that Knott’s Berry Farm was having their dollar days. There were 7 of us, so we saved a lot of money. Some of the things that were on special for only $1 that day were the ices, popcorn, hot dogs, pizza slices, and soda, to name a few. WE only stayed a few hours because it was very crowded. Luckily, we have the season pass, so we can always go another day, when there’s less people. My favorite time of the year to go to Knott’s Berry Farm is during the Boysenberry Festival and during the Christmas season. A few weeks ago, my boyfriend and I went to see a friendly soccer match between AC Milan and Manchester United. AC Milan is my boyfriend’s favorite team ever, they’re from Italy. Manchester United is a team from England. I like AC Milan, though they aren’t my favorite. Originally, they were supposed to play in Pasadena, California at the Rose Bowl which is about 20 minutes from where I live. Unfortunately, due to low ticket sales, they moved the game to a smaller stadium, Stub Hub Center in Carson. This was such a hassle for me because this stadium is over an hour away from my home. We went to the game for my boyfriend’s birthday. We both wore our Leonardo Bonucci Milan jerseys. I was lucky that I didn’t have to drive us to the game that day because it was a weekday and there was so much traffic. We got to the game on time and there was a lot of people surprisingly. Most of the people there were rooting for Manchester United. I noticed that casual soccer fans tend to root for the English teams thinking they are much better, but that’s not usually the case. Anyways, the game was really good. AC Milan did not win unfortunately. The game had ended in a tie, so they went to penalties. Penalty shootout went on for a long time! Everyone had a turn, even the goal keepers 😂 It’s always fun to see teams from Europe come and play friendlies here during the summer. 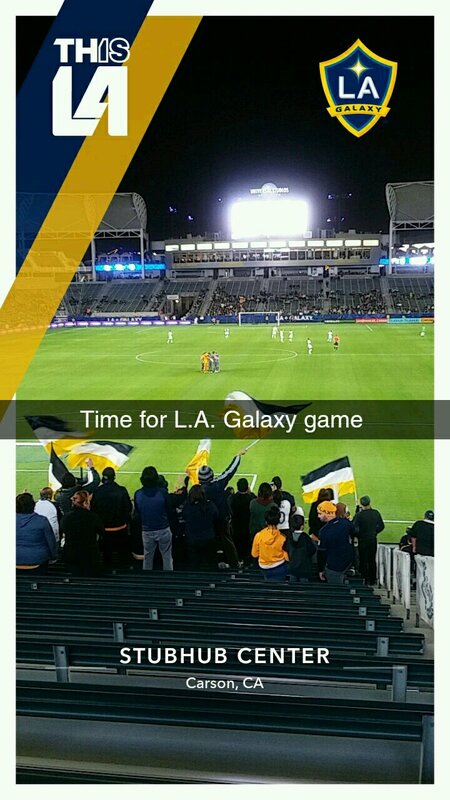 I have been an LA Galaxy fan since mid 2010/early 2011. A few years ago, I even had the season tickets. But once I started working, I could no longer go to games because I was always working weekends. Last year, in 2017, I only went to two or three games. Now that I left my supermarket job, my weekends are free! So I plan to go to a lot more games this year. My friend Gio gave me a ticket to LA Galaxy’s preaseason game against New York City FC (NYCFC) over the weekend. She said it was my birthday present. Earlier in the day, I went for a 17 mile run. I was exhausted when I got home and wanted to stay in bed all day. I was almost going to miss this game, but I forced myself to go. I am so glad I did. It was a good game! LA Galaxy won 3-0. However, since this was their first game together, with so many new players, they were rusty. But they defended well and had a few shots on goal. They had a lot of things they ned to work on, but I am hopeful that they have a better season than last year! A lot of people say 2017 was a bad year, but for me personally 2017 was a great year! Here are a few things that happened in 2017. After so many years of going to school, both back in community college and Cal State LA, i could finally say I got my degree. It was tough at times, going to work part time and going to school full time. To make things harder, I didn’t have a car for most of my college years, which meant i was usually going to school and work on the bus. It took me a little longer than I had expected to get my degree, but better later than never right? In August I decided that I needed to get a second job because I wasn’t getting enough hours at the supermarket where I was cashier. So i decided to apply to a few local areas. Someone I knew from the gym where I have been going since 2016 told me they were hiring there. I decided to give it a shot even though I felt there was no way they would hire me. I was wrong. Within two weeks of Applying, I got hired! I was so happy. For three months, I worked both jobs. It was hard at times, but I decided to stick with it. At the end of 2017, I decided two jobs was two much and I needed to pick one job. My choice was easy. I picked the local gym. Which brings me to this major thing i did in 2017. I finally left the job I had for 5 years. This was pretty scary, not going to lie. I was not happy at this job, I spent all year being miserable, but I was too scared to quit. I had originally planned to quit in May after my graduation, then I decided summer I would get more hours so I Should stay a little longer. then decided I would quit in September, that didn’t happen either. I said I would quit around Thanksgiving, that didn’t happen either. I finally said that I would quit December 31, and i didn’t want to keep postponing it. I gave the manager my two weeks notice on December 15, 2017, the whole process was easier than I had expected. December 31, 2017 was my last day and it was a really long 8 hour shift. Before I quit, they gave me a certificate for being there five years. It was bittersweet. On one hand, I was happy to be getting away from retail life and rude, demanding, self entitle customers, but I will miss the friends that I made while working there. I never thought I would one day be able to run 26.2 miles, but on my 26th birthday, I decided I wanted to celebrate turning 26 years old in a big way, so that’s when I decided to run a marathon. My first ever marathon was in Long Beach, California and it took me about 5 hours and 17 minutes to finish. it took me four months to train for it. I thought this would be my only marathon ever, but I signed up for the LA Marathon, March 2018, and I am currently training for that. I went with my friend Giovanna. We have gone to Portland, Oregon, Washington DC, and now Orlando together. We went to Universal City Walk, where I had the best tasting milkshake ever, red velvet with a red velvet cake. Yum! We also went to Universal Studios, where we went on so many rides and got to visit the Wizarding World of Harry Potter. I tried butterbeer for the first time. Besides Wrestlemania, we also went to Monday Night Raw, NXT Takeover, and the WWE Hallf of Fame. This was a once in a lifetime opportunity and I had so much fun. We got to meet a few wrestlers at one of the events, inclduing Baron Corbin and R Truth. Wrestlemania was amazing. Our seats were so close. We got to see Undertaker retire, Seth Rollins vs Triple H, Hardy Boyz make their return, John Cena propose to Nikki Bella, and many other things. I had never been to Las Vegas, which is crazy because I am 26 years old and most people go there for their 21st birthday. I never had much interest. Until I decided to run the Rock’n’Roll Half Marathon and 5k. I went with my mom, grandpa, and three of my sisters. My mom drove us there and it took forever to get there. I had fun there, i didn’t gamble once, but i did have fun walking around and trying the all the different drinks. One of my favorite things that I did was getting on the roller coaster at the New York New York hotel. The first time was with my family, my mom, three sisters, and brother. We did all the touristy things, like visit the Golden Gate Bridge and the Full House/Fuller House house. We ate crepes and clam chowder, which was super good. The second time I went, it was only with my grandpa and my sister Destiny. I went to run the San Francisco Half Marathon. It was one of my best races. I can’t wait to go back to San Francisco this year. It is a much nicer place than i ever thought. It is one of my top favorite places to run. Went to the Coliseum in Downtown LA with my sister Angelina to watch Real Madrid vs Manchester City. Manchester City won, but it was fun just seeing them. While I was there, I ran into my friend from work and his friend, who is a manager at my old job. These are the major things that happened in 2017. I was also blessed to meet people who I now consider my friends, I lost a couple friends, but made new ones. I spent time with my family, boyfriend, and friends. Hope 2018 is just as good or even better than 2017 was! Labor Day, which was a little over a week ago, signifies the end of the summer for most people. Summer 2017 was good for me. It started off when I finally graduated and got my bachelor’s degree in history from Cal State LA. I also went to San Francisco twice- once on a road trip with my family for a vacation after 4th of July and the second time in a plane with my grandpa and sister for a half marathon I signed up for. I also started training for my first marathon at the beginning of June. One of the first things I did in summer was take my sister Angelina to Monday Night Raw. It was at the Staples Center in Downtown LA, so of course we had to go to Bottega Louie for macarons. We also went to Little Damage for the first time. I had avocado ice cream, which happened to be vegan and it was actually really good. Earlier in the day we got to meet Bayley in Compton and take pictures with her. At Monday Night Raw, we saw Enzo Amore and Big Cass, who had broken up earlier in the month. Even though it is scripted, their breakup really sucked. I thought they should’ve had a chance to be tag team champions for a while before breaking up. We got to see our faves, Sasha Banks, Cesaro, Sheamus, etc. Every summer, my family goes on vacation for a few days. This year we decided to go to San Francisco/Northern California for 3 days. The last time my sister (Destiny), my mom, and I went to Northern California was about 13/14 years ago, when I was 12 or 13 years old. This time it was going to be my mom, my brother, three of my sisters, and me. My sister Aleah stayed with my grandma because she said she didn’t want to walk around so much. We went on our trip July 5, 2017. We left our house early, around 5 am. After all, my mom was going to drive from our hometown to San Francisco which was about an 8 hour drive or so. It was so hard to wake up early especially since the day before was 4th of July and I had worked a long shift and then we watched fireworks before going to bed. We stayed in Oakland because it was much cheaper than staying in San Francisco. We got to there a little late. After checking into our hotel, we went to the Jelly Belly factory which was in Fairview. We got to tour the factory and got samples at the end of the tour. We took so many pictures, especially of Ayanna. Afterwards, we went to the hotel and just rested. We went to McDonald’s for dinner and they had garlic fries. They were surprisingly good, even if it was fast food. The following day we went to San Francisco. One of the first places we went to visit was the Full House/Fuller House house. We also got to walk across the Golden Gate Bridge, visit Fisherman’s wharf, and visit the seals at Pier 39. I treated my family to lunch at a crepe place. I got a turkey crepe with pesto. My mom got clam chowder, which was sooo good. On our way back home, we decided to stop by and visit Sacramento, the capitol of California. It was so hot that day, over 100 degrees. As someone who enjoys history, I am a history major after all, it was interesting to see the history of California. We had a long trip home. I think we ended up getting home around 8 or 9pm. I went back to San Francisco towards the end of July for the weekend. This time my sister Destiny and grandpa joined. The reason I went was to run a half marathon. I was doing a challenge. Run a half or full marathon in Surf City (Huntington Beach, California) and a half or full marathon in San Francisco and you would get an extra medal called the California DReamin’ Racing Cup. On the first day of July, I somehow stubbed my toe and was in so much pain that I could barely walk. I ended up not running for about 3 weeks. I was worried that not training for so long would affect my run. This was my 3rd half marathon of the year. I was so stressed out, not only because I felt I didn’t train enough, but also because San Francisco is known for their hills and hills were my weakness. I guess I didn’t need to worry so much because I ended up running my best time, 2:21. Getting to San Francisco was a hassle for all of us. I went to San Francisco first. This was my time ever going on a plane by myself. In the past, I usually travel with my friend Giovanna, sister Destiny, grandpa, or mom and grandma. Although I have been in planes before, I was terrified being alone. I listened to my iPod and read my books to keep myself occupied. The first thing I did when I got to San Francisco was go to the expo to pick up my bib and t-shirt for the race. Then I went to check in at my hotel. It took me almost an hour to walk there. I ended up walking through North Beach, which is like their “Little Italy” and somewhere I would like to stop by when I go with my bf. It felt so weird exploring a major city like San Francisco all alone. I don’t have much experience travelling alone. I am at the age (26) where travelling alone is encouraged and I would love to be able to do this more often, if only money wasn’t an obstacle! After checking in, I went to my other hotel and waited for my grandpa and sister. It might be weird that I had two hotel rooms, but the reason for this is that when I had made plans to go to San Francisco, it was originally going to be me by myself. The original hotel I reserved was close to the starting line. The other hotel was in Sausalito and I would have no way of getting to the starting line because the Golden Gate Bridge was going to be closed in the morning. My sister and grandpa had a tough morning. My sister couldn’t find her id anywhere and we were all so stressed that she wouldn’t be able to fly to San Francisco. Somehow they allowed her to go to San Francisco. I stayed with them for a while and at night I went to my hotel. It was soo small! It was smaller than my bedroom back home and it didn’t even have a bathroom. There was a bathroom that each floor shared. I was so scared that night I couldn’t sleep much. In fact, I only slept an hour. I just stayed awake listening to my iPod, reading, and talking to my friends on Snapchat. I left my hotel around 430/5 am on race day. The weather was perfect. We started our race in the Golden Gate Park. I felt good when I started running. I just tuned everything and everyone out and focused on my running. We passed by so many historic San Francisco neighborhoods. We even passed by the San Francisco baseball stadium. I’m not a big fan of baseball so I’m not sure what team plays there, but it looked like a nice stadium. After the race was over, I met up with my grandpa and sister at Pier 39. After running 13.1 miles, I had to walk another 1.5 miles to get there. We went on a boat ride and passed by the seals on Pier 39 and even got to see Alcatraz from far. This was my first boat ride and while I didn’t get seasick, I was pretty scared being out there especially when the boat driver said we were in 100 feet deep water. I finally got my clam chowder and it was so good. Can’t wait to go back to San Francisco to get that again. We also went to the bakery where they make sourdough bread. Another thing San Francisco is known for. Afterwards we went to the Golden Gate Park. We went to the Japanese Tea Garden. It was fun. We left a little early because it was super windy. When we got back to our hotel, we just watched soccer on TV. My next runcation will be in Las Vegas. I plan to go with my family on a road trip for the weekend. I will be doing a 5k on Saturday night and a half marathon on Sunday night. Both races are part of the Rock ‘n’ Roll Las Vegas weekend, can’t wait! After coming back from San Francisco, I was able to resume my training. In fact, in August I ran the most miles. I ran a total of 89 miles! I even started running my long runs. Prior to training, the longest I had ever run was 13 miles. In August I ran 20 miles! It took me about 4 hours, which is not very fast, but this was something I never thought I could do. I have only been running for about a year and at first running a mile was a struggle, so running 20 miles was a huge accomplishment for me. It shows that with training and belief in yourself, you can achieve things you thought were impossible. I did a few other smaller races. I ran three 5k races. One at the Stubhub, where LA Galaxy plays. Another one was at the OC Fair. I did that one with my sister, it was her first 5k and she did a good job. The last 5k I did was at Griffith Park. I got my best time for a 5k, 25:30. I also went to a soccer game with my sister at the Coliseum. We watched my two favorite teams, Real Madrid and Manchester City. City won 4-1. While at the game, we ran into two of my coworkers, my friend and my manager. They even got me a beer even though I normally don’t drink. So that was my summer in a nutshell! I had a really good summer, spent it with family, my boyfriend, and friends.